Available exclusively through Home Leisure Direct in the UK, we provide the whole Brunswick range of shuffleboards. At Home Leisure Direct we stock a great range of Brunswick Shuffleboards, some of the most attractive shuffleboards in the world, available exclusively through us in the UK. Brunswick, established in 1845, have been making games tables for over 170 years. When you invest in a Brunswick product, you not only own the most beautiful, best-playing games room products in the world, you also become a part of this legendary heritage. Here at Home Leisure Direct, we are incredibly proud to be the only Official Brunswick Shuffleboards Retailer in the UK. Selected by Brunswick because of our industry-leading website, specialist installers and expert sales advisors, we are able to offer you a first class service. Brunswick shuffleboards are known worldwide for their outstanding build quality and playability. Their long experience of creating beautiful games tables shows in every product they make. Whether your room is contemporary, modern, classic or traditional, public or private, a Brunswick shuffleboard table will create the ambience you desire. 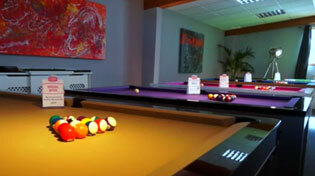 Brunswick tables are available in a choice of sizes, to suit your gaming space. Both the Delray and the Andover are available in 12ft and 14ft size, so you can always enjoy a game of shuffleboard, wherever your table is situated. Brunswick Shuffleboards are made using the finest materials available, including yellow poplar and North American maple woods, and surfaced with a polymer resin for an exquisite appearance and appearance. The resin playing surface on every Brunswick shuffleboard also offers a lifetime guarantee; a testament to Brunswick's quality and confidence in their products. Every shuffleboard Brunswick build is backed by a lifetime warranty, a testament to the exceptional design and workmanship the Brunswick name represents. So whether you own your table for a season or a lifetime, you'll never regret buying a Brunswick. Brunswick stand behind the quality of every shuffleboard they make. Please see our Brunswick History section for more information about this manufacturer and its long history in making billiards and games room products. We can also supply additional accessories to enhance your shuffleboard game, including scoreboards, lighting to get the best possible view of the playing surface, and protective wax with which to treat your playfield surface for extra protection. At Home Leisure Direct we supply your Brunswick shuffleboard with free delivery and installation to most locations within mainland UK. The delivery will be professionally handled by one of our fully insured specialist two man delivery teams. It will be placed in a ground floor room of your choice, and all packaging removed. This ensures you have the best service from Brunswick shuffleboards and Home Leisure Direct, from the moment you order to the start of your first game.